Georgia - IOM Georgia has launched a regional two-year project: Enhancing Mechanisms for Prevention, Detection and Treatment of HIV/AIDS and Tuberculosis (TB) among Migrant and Mobile Populations in the South Caucasus Countries. It will be implemented in close collaboration with IOM Missions in Armenia and Azerbaijan, and with national authorities and partners in the three South Caucasus countries. 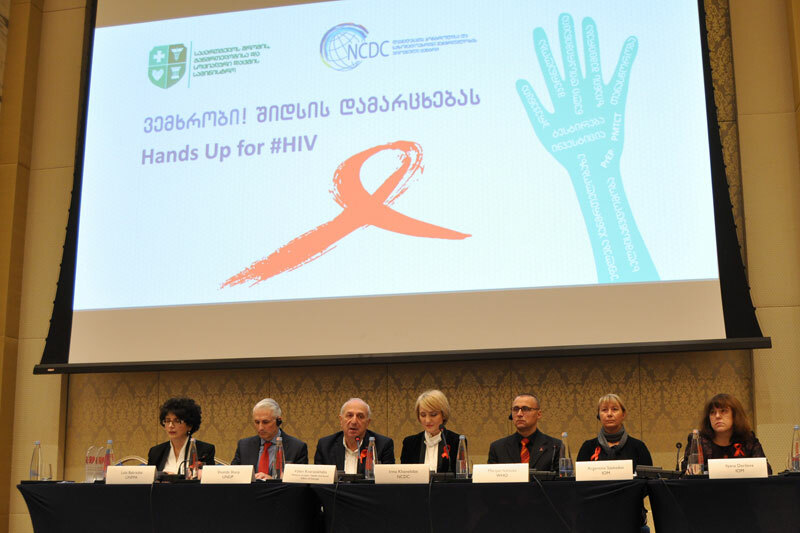 The launch took place at a national conference hosted by IOM Georgia, in coordination with the Ministry of Labour, Health and Social Affairs and the National Center for Disease Control and Public Health (NCDC) on World AIDS Day (1/12) in Tbilisi, Georgia. “Over the past decade IOM has recognized the importance of addressing HIV-related challenges over the whole course of migration, be it in country of origin, transit, destination or return. Targeting only migrants is not the correct way to address it – our approach should be all-inclusive,” said Vienna-based IOM Regional Director Argentina Szabados. “In this holistic approach, we also need to pay due attention to migration as an inseparable part of our life-cycle and ensure that HIV prevention and care services are accessible for all migrant and mobile populations,” she added. IOM and national actors in the region recognize that while migration itself does not cause disease, mobile populations are at greater risk of HIV infection throughout the entire migration process. The lack of access to health care facilities and prevention measures pose risks for both migrants and local communities. In fact, health inequities, inadequate social protection, human rights violations, stigmatization and discriminatory policies increase the vulnerability to HIV infection for all. “The UN Programme for Sustainable Development for the upcoming five years duly considers HIV prevention and treatment responses and focuses in particular on most-at-risk populations,” said Lela Bakradze, UNFPA assistant representative in Georgia. “We are elaborating standards of HIV prevention services for most at risk groups and we would like to encourage the investment in preventive measures, especially among young people,” she added. Marijan Ivanusa, Head of the WHO Country Office in Georgia, noted that the latest data available in the WHO European Region showed that the number of newly diagnosed cases were over 153,000 in 2015, which meant that every day over 400 people in the region are infected with HIV. “The reality is even worse, because many people do not know their HIV status, since they don’t take the test. One person out of seven in EU countries doesn’t know their status. And this is one of the main reasons why the epidemic is continuing,” she added. In Armenia, Azerbaijan and Georgia, IOM will cooperate with governmental institutions in charge of HIV/AIDS and TB surveillance to ensure the capacity building of relevant national authorities and facilitate the progress of cross-border referral mechanisms, as well as the elaboration of migrant-sensitive and inclusive healthcare policies. A Regional Health Promotion Campaign targeting migrant and mobile populations to raise awareness of HIV/AIDS and TB, focusing on preventive screening and treatment adherence, will also be conducted.